Wildfire, insect outbreaks and hurricanes destroy huge amounts of forest every year and increase the amount of carbon dioxide entering the atmosphere, but scientists are now learning more about another force that can significantly affect their climate impact. Researchers conclude in a new study that the albedo effect, which controls the amount of energy reflected back into space, is important in the climatic significance of several types of major forest disturbances. In some cases  mostly in boreal forests with significant snow cover  increases in reflectivity can provide cooling. If the area disturbed by fire or insects is large, this cooling can substantially offset the increase in global warming that would otherwise be caused by these forest disturbances and the release of greenhouse gases. In other cases where the ground itself is unusually dark, albedo decreases can magnify concerns about warming. Wildfires are not the only disturbance that significantly alters surface albedo, this study concluded. Insect outbreaks and defoliation by hurricanes can also change surface reflectivity, with effects on climate as great as those caused by carbon dioxide release from the disturbed area. "On a global scale, warming caused by increased carbon dioxide still trumps everything else," said Beverly Law, a professor in the Department of Forest Ecosystems and Society at Oregon State University. "On a smaller or local scale, however, changes in albedo can be fairly important, especially in areas with significant amounts of snow, such as high latitudes or higher elevations." Albedo is a measure of radiation reflected by a surface, in this case the surface of the planet. Lighter colors such as snow reflect more light and heat back into space than the dark colors of a full forest and tree canopy. "This decreased absorption of heat by the land surface is a local atmospheric cooling effect," said Tom O'Halloran, a recent postdoctoral researcher at OSU who is now with the Department of Environmental Studies at Sweet Briar College. "This was clear in one case we studied of trees killed by mountain pine beetles in British Columbia. "In areas with substantial snow cover, we found that canopy removal due to either fire or insect attack increased reflected radiation and approximately offset the warming that would be caused by increased release of carbon dioxide," O'Halloran said. "However, we haven't been able to measure the full impact from the current beetle outbreak, which could take decades to complete." This complex phenomenon would be much less in lower latitudes or areas without snow for much of the year, the researchers said. It relates primarily to boreal or colder mid-latitude forests, such as the Canadian insect outbreak over 374,000 square kilometers of forest. "The impacts of insects on forest carbon dynamics and resulting changes in albedo are generally ignored in large-scale modeling," Law said. 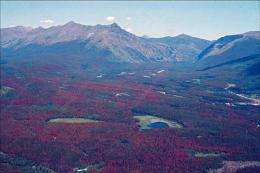 The study also found that forest disturbance does not always cause an albedo increase. When Hurricane Wilma in 2005 partially defoliated more than 2,400 square kilometers of a mangrove forest in the Florida Everglades, it exposed an underlying land surface darker than the previous forest canopy. In that case, an albedo decrease effectively doubled the warming impact of released carbon dioxide. All of the forces studied in this research  fire, insect attack and hurricanes  are expected to increase in severity, frequency or extent under climate change scenarios, the scientists said. In the United States alone, these events affect 20,000 to 40,000 square kilometers of forest a year. If Earth system models are to be accurate, this makes it important to more accurately incorporate changes in albedo. Globally, forest disturbances are a major factor in the carbon cycle and greenhouse gas warming. They can instantly switch forests from carbon sinks into carbon sources for two decades or more. In cold regions where forest recovery is slower, albedo increases can persist for 100 years.